by David Smethurst – The last Saturday in April is always a special day to trout fisherman. It’s the Trout Opener. Even though today it is more of a tradition that an event, with so many streams open, some under special regulations, I think you can fish for trout somewhere every day of the year. Nonetheless, it is deep in our trout bum brains that this is still a special day. Maybe more than any recent opening days, I’m excited. I recently finished a new book that got me thinking, smiling and optimistic. 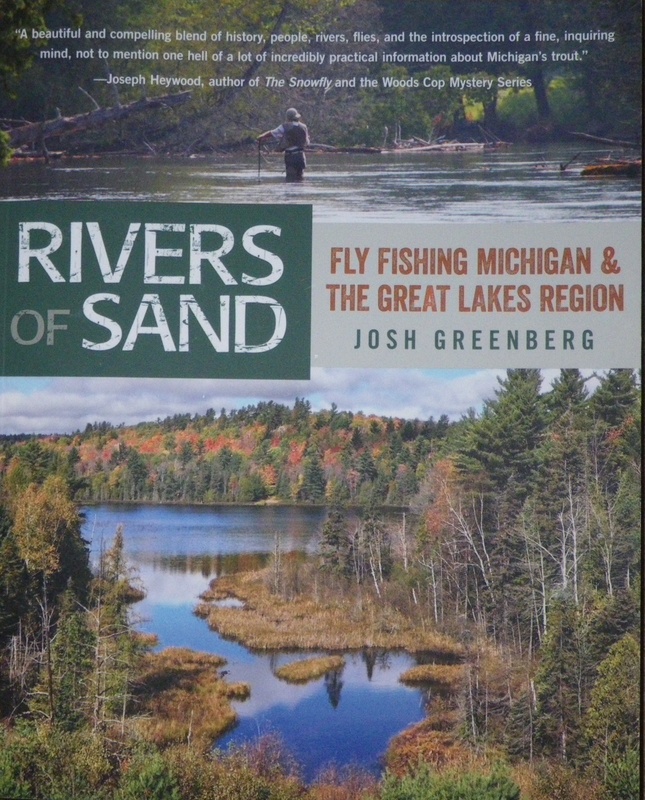 Josh Greenburg, owner of one of the iconic fishing lodges and shops in the country, Gate Au Sable Lodge, outside of Grayling, has written a wonderful new book, River of Sand: Fly Fishing Michigan and The Great Lakes Region. Written in what seems to me to be a conversational style, it is a book of stories about Josh’s fishing trips, alone, with clients, or with friends. There are three things I really like about this book that make it, along with Spring Creek, by Nick Lyons, one of my all-time favorites, both to be read – and reread. I’m a “seasoned” trout angler. I usually catch fish unless I’m distracted by, oh, cedar wax wings in a spinner fall of mayflies, or a turtle inspecting my boots as I sit on a log (a small one, not a big snapper), or an emerging Hexagenia mayfly in the silt behind the log. But when I do fish, I usually know what to do. As I read Rivers of Sand, I found myself saying, yeah, that’s how I do it too. And then, on the next page, I find another fly fishing tip in the story and a, “duh why didn’t I think of that?” I’ve rationalized that well in my mind by saying to myself, I’m just a part time angler and Josh is a full time pro. That makes me feel better about myself. You too, will find “duh” moments and learn. Josh, a full time conservationist as well, writes beautifully about what he sees and feels along our trout streams. In my twenties, I read Robert Traver’s Testament of a Fisherman. “I fish because I love to, because I love the environs where trout are found, which are invariably beautiful…” That touched my brain and Josh feels and conveys that same emotion. Josh writes about what I call river music, “All this talk of rising fish, the endless varieties of gurgles, burping sounds, splashes, sips… these are all trout noises….Then there is the sound of the river itself. The river has a multitude of gurgles and bloops caused by nothing more than the current itself. It could be boiling over a submerged log, or lapping against a cut bank.” Can you sense standing in a trout stream from Josh’s words? I can. By the way, Robert Traver (a.k.a. by his real name, John Voelker) is the third in my trio of favorite angling writers, but it his collection of books, rather than one book that makes the reread list. I worry that many of the younger trout anglers have not read Traver, or Lyons, and others like Marinaro, Flick, McGuane, Hemingway, Haig-Brown, Scwiebert, or Gierach. Fly fishing has such great literature, as well as how-to- do-it books. There are more – but find them for yourself. Stop at Gates and buy one, Josh will sign it. If you’ve never been there, you are in for a treat, and great food, too. Get to know Josh, in person and through his books. Yeah, I said books – plural. He just has to write another, and another. Great writer. Good man.